Sue Ridley continues to enjoy a long and illustrious running career. 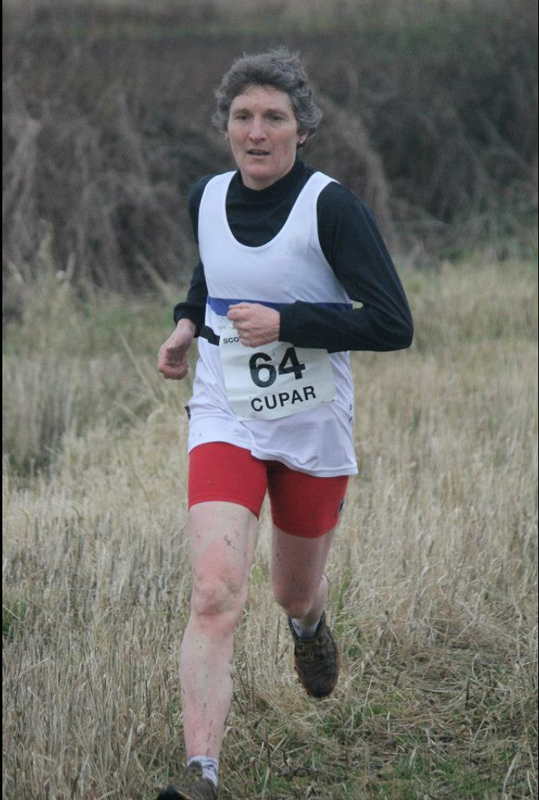 As a senior, she was Scottish National Cross Country Champion in 1994 and won four other individual medals as well as four team golds (Edinburgh Woollen Mill 1992 and 1993; Edinburgh AC 2011 and 2013). As a veteran she has secured six Scottish Masters CC titles: W35 in 2001, 2004 and 2005; W40 in 2008; and W45 in 2013 and 2014; plus four successive team golds with Edinburgh AC (2011-2014). In addition she has been an absolute stalwart for Scotland in the annual British and Irish Masters CC International, winning several team medals and an individual gold medal (W35 at Croydon in 2004). Sue has also been a winner on the track gaining outdoor Scottish National titles at 3000m (1992 and 1994) and 10,000m (1993 and 1996) as well as 3000m indoor golds in 2005 and 2011; plus of course umpteen Scottish Masters titles. She is undoubtedly a tough competitor but is invariably modest, cheerful and friendly. In my first year at high school, I was first home in a cross-country and one of the girls said I should join her training group at Innerleithen coached by the late Johnny Robertson. I did and never looked back. Both my parents were a great support, especially my dad (until his sudden death when I was 18). But it is Bill Blair, my former coach, that I owe my successful career to (and the great training group he had). I love running. I have been lucky enough to have competed all over the world (often accompanied by my family) and met some terrific people many of whom are now great friends. Nothing beats going out for a run in the countryside, whatever the weather! I have also had the honour of carrying the Scottish flag at the World Mountain Running Championships in Sauze d’Ouze in 2004 and the honour of reading the Athletes’ Oath at the Opening Ceremony of the European Masters Mountain Running Championships in Nowa Ruda in 2014. Winning the National Cross-Country Championships in 1994 at Irvine was special. This was during a 5 year period where I had a top 3 placing. Also, winning the UK Inter-Counties 10km Road Race Championships (after a battle with Sandra Branney) nine months after I took running up seriously and teamed up with Bill and his group. Not listening to the advice of my coach Bill Blair when he advised me not to compete for Scotland in a 5km at an international athletics meeting in Turkey in 1994. I thought I may never run for Scotland again if I turned it down so did run finishing just behind Hayley Nash of Wales in extreme temperatures. I came back with an ME related illness which took about 7 years to overcome and I believe stopped me from fulfilling my potential. If I could spend more time training, I’d love to run the West Highland Way or an ultra but most of all I’d love to be able to keep running for as long as I can. Looking after my 2 horses, riding, walking, gardening, cooking, DIY, coaching my daughters’ primary school’s running club and any activity involving my family. I am also treasurer for a local organisation helping people with disabilities take part in music and drama. Meeting top class athletes when I competed as a senior and latterly as a vet, former Olympians eg Willlie Banks and a chance to race Zola Budd. Exciting and challenging races that pushed you to your limits. The very many happy memories I have of the places I’ve been to and the people I’ve met. I love the camaraderie and the great sportsmanship shown (especially in masters athletics) but most of all watching people of all ages trying to do their best and enjoying themselves showing that age is no barrier to achievement. Due to my busy lifestyle and resulting time constraints, I only manage about 25 to 30 miles per week. I try to do a long run (approx. 45-50 minutes), a shorter run about 30 minutes 4 or 5 times a week in which I try to incorporate a time-based interval session on 2 of these days and a rest day! As a senior, I averaged around 50 miles a week incorporating a long run, 3 interval sessions (one based on longer reps eg reps of any distance from 600m up to a mile; one based on shorter reps eg reps of any distance from 200m to 500m; hill reps (mainly in winter) or a speed endurance type session); tempo run (winter) and easy runs. I still played senior hockey which involved weekly league matches and tournaments. I’ve had many great races battling against Sonia Armitage in a 1500m but I think the Scottish Masters Indoor at Kelvin Hall in 2009 (I think) was the most exciting with me making my move on the final lap and having to fight every step of the way to hold Sonia off. I have a tremendous amount of respect for her and really enjoy racing her. The 5000m in the Senior Championships at Pitreavie in 2009 also holds happy memories. Benita Johnson was running and I had been carrying a hamstring injury so was near the back of a group of about 7. With around 550m to go I just took off as I could sense Benita was getting close and reached the bell just ahead of her. I continued my run expecting some of my younger rivals to come past me in the closing stages but remarkably they didn’t and I came third with only Emma Raven and I not having been lapped! At the end, Benita came up to me and said “congratulations, that was phenomenal!” I still treasure the photo that was taken of Benita, Emma and I. Another of my favourite moments was during the European Masters Cross-Country Championships in Ancona in 2009 where I had won the W40 cross country and after being presented with my medal, my 3 daughters were invited onto the podium too. I have competed in some extreme weather from -12 degrees to over 40 degrees, but I think the worst conditions I have ever run in were those encountered at the 2014 Scottish Masters Cross-Country championships in Hawick – I have never been so cold and suffered so much before, during and after a race! At Glasgow Airport while waiting for the flight to Derry, I took the opportunity to chat to my friend Sue when she was a captive audience in the café! She reminded me that, although in first year at secondary school she was involved in hockey, badminton and pony club events, she started running because there was a two-mile cross-country session on a wet afternoon. She finished first, although the second girl was trained by Johnny Robertson at Inverleithen. Sue joined his group and her long career started then. She joined Edinburgh Southern Harriers as a sprinter (a skill which may have come in useful the day after we talked – see the Derry report). Then she took part in Scottish Women’s Cross Country Union Championships and particularly remembers a race in snow at Lanark – which she loved! Sue must be the fittest chartered accountant around, quite defeating any stereotype of that profession. She is married with three children and, when she gets home from work, has to exercise several horses, so she has always been very busy. Consequently, she does not run many miles per week but makes the most of a shorter, more intense, training schedule. This has certainly paid handsomely, especially after 1990 when her coach became Bill Blair. Ten months later, after a close battle with Sandra Branney, Sue won the UK Inter-Counties 10k Road Race title at Moreton-on-Marsh. She was Scottish Champion twice at 3000m and twice at 10,000m, as well as obtaining two 3000m indoor golds. Then in 1994 she became Scottish Senior National Cross Country Champion at Irvine Beach Park over a famous tough but fair course. Four Senior National team golds were taken between 1992 and 2013. This was during a five-year period when she was never out to the top three. Later that year she ran for Scotland on the track: 3000m in Israel; and 5000m in Istanbul, where although she ran fast, severely hot conditions depleted her immune systems so that she contracted an M.E. type disease which affected her for seven years and, very frustratingly, prevented her from achieving her full potential. Nevertheless, Sue Ridley has continued to race very well: in Home International cross country matches as a senior and of course a Veteran/Master. She has represented Scotland on the track, in the country, on the road, and also in the hills! She ran the European and World Mountain Running Trophy championships several times. Sue won the W35 European Masters 10k road title in Portugal and then finished second in the Half Marathon. She was also victorious in the 2009 W40 European Masters cross country championship in Ancona. Naturally, umpteen Scottish Masters wins have been secured. The British and Irish Masters XC has been a special favourite, which Sue has run successfully on many occasions, including individual W35 gold at Croydon in 2004. She is undoubtedly a tough competitor but is invariably modest, cheerful and friendly. Sue says that, on the track, her favourite event was 3000m. As a Masters athlete, cross country is enjoyed most. As a favourite race, the annual Lasswade cross country event (which used to be at Bonnyrigg but now takes place in Gorebridge) is nominated. Over many years, Sue has only missed a few of these events, which are run in November. The organisers, competitors and spectators are friendly folk. The course can be muddy, partly flat but otherwise undulating. Sometimes steep climbs and long descents feature. Nowadays, female athletes race 6 k along with under-17 boys. An accident involving a horse three years ago may have slowed Sue Ridley’s racing speed but, as Derry proved, her success is likely to continue for many years yet!